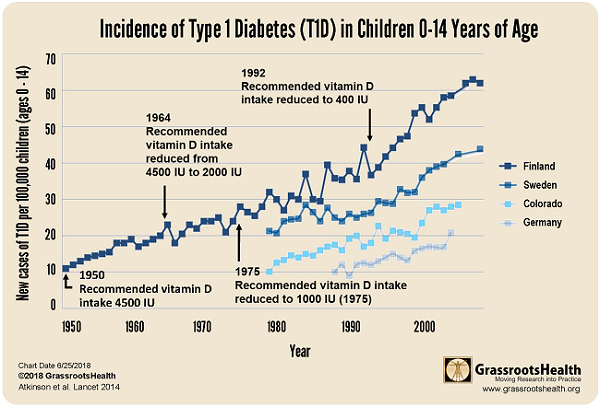 What’s needed to solve the vitamin D deficiency and type 1 diabetes (T1D) epidemics? An increasing body of evidence has shown that chronic inflammation can cause or advance many common chronic diseases, such as diabetes, with higher levels of cellular inflammation indicating a greater risk of the development of and/or accelerated progression towards chronic disease. The following combination of tests can be used to help track and manage inflammation. This project will help identify potential changes in T1D diagnosis and autoantibody status that may result from vitamin D and omega-3 fatty acid testing and education, as well as provide additional education about islet autoantibodies, inflammation, and other T1D related information. Scholarships are available to those who have been identified as being at risk for developing T1D, by having tested positive for one or more of the known islet autoantibodies for T1D. The scholarship will cover the all tests in the Inflammation Panel listed above (Vitamin D, Omega-3 Index, AA:EPA Ratio, hs-CRP and HbA1c). 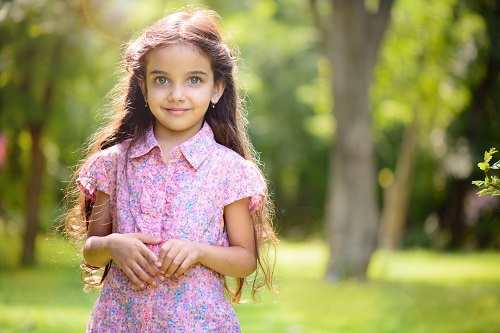 Please consider a donation towards this scholarship fund – help children and their families gain access to this opportunity to receive free testing and help prevent T1D. Who is at risk of developing T1D? Family history is an indicator of T1D risk, however, other factors are associated with the development and progression of T1D, such as inflammation, autoantibodies, vitamin D3 deficiency, even viral infection. The presence of islet cell autoantibodies (such as IAA, GADA, IA-2A, ZnT8, and ICA) indicates an autoimmune response against the cells of the pancreas, and is strongly associated with development of T1D. Improved vitamin D3 and long-chain omega-3 status, as well as decreased inflammation, have been associated with lower levels of these antibodies and therefore lower risk of T1D development. An increasing body of evidence has shown that chronic inflammation can cause or advance many common chronic diseases (1), with higher levels of cellular inflammation indicating a greater risk of the development of and/or accelerated progression towards chronic disease. Type 1 Diabetes (T1D) is one of the diseases that are highly affected by inflammation (2,3). It is known that progression to many forms of diabetes, including T1D, can be predicted by measuring levels of inflammation. 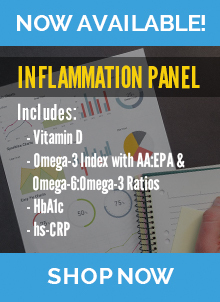 Research has also shown that vitamin D and omega-3 fatty acids are both anti-inflammatory (4,5), therefore, progression of T1D could be predicted by measuring levels of inflammation using such blood spot tests as 25(OH)D (6,7,8) and the ratio of AA:EPA (9). 48 international vitamin D researchers have recommended a vitamin D serum level of 40-60 ng/ml (100-150 nmol/L) for the prevention of many chronic diseases, while a AA:EPA ratio of <3 is a target for the most reduced rates of chronic inflammation. 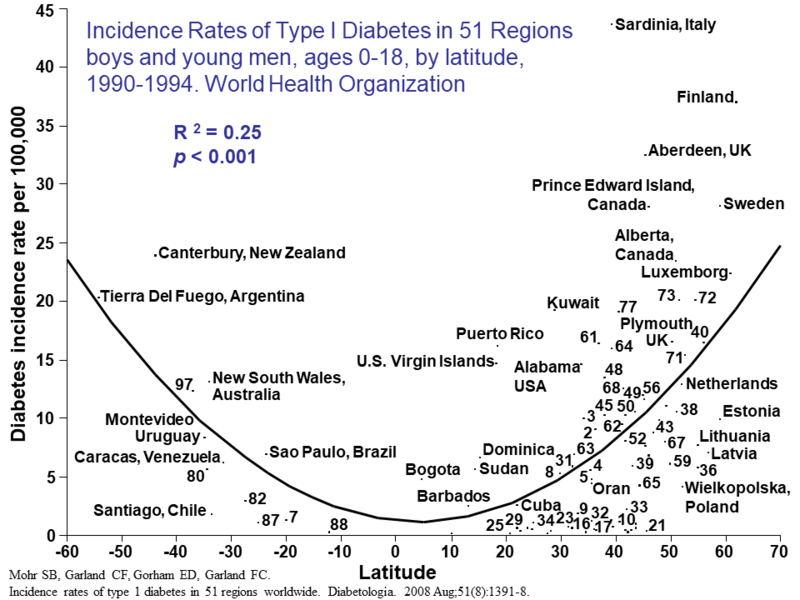 Studies have also examined the incidence of T1D in countries at different latitudes, and found that countries further away from the equator, where there is less UVB available to produce vitamin D in the skin year-round, have a higher incidence of T1D. Omega-3s are often found in foods that are also naturally high in vitamin D (such as fatty fish). There is very little research available on the combined effect of vitamin D and omega-3 fatty acid intake and resulting blood levels on specific health outcomes. Incorporating omega-3 education and testing (using omega-3 status testing such as the Omega-3 Index and the ratio of AA:EPA (27,28)) along with vitamin D education and testing will help shed light on such a combined effect. It will also allow us to study levels of both nutrients independent of consumption since the effect of intake on blood status will vary from person to person, and it may take different doses to reduce inflammation if a person has a diet high in AA. The ratio of omega-6 (pro-inflammatory) to omega-3 (anti-inflammatory) fatty acids in humans has changed from 1:1 to 20-30:1 over time (4,29,30). This study sub-set will help identify potential changes in the progression towards a T1D diagnosis that may result from nutrient status testing and education of both vitamin D and omega-3 fatty acids, as well as provide additional education about islet autoantibodies, inflammation and anti- and pro-inflammatory foods, and other T1D related information. Register to have your vitamin D and Omega-3 Index with AA:EPA ratio levels tracked every 3 months, and be an important part of this project to solve the type 1 diabetes epidemic. Scholarships for free testing are available if you have tested positive for one or more islet cell auto-antibodies. T1D has been diagnosed in approximately 1.3 million people in the U.S., including about 200,000 young people under 20 years old. The incidence continues to increase 3-5% annually. By 2050, the expected prevalence of T1D is estimated to be 5 million people in the U.S., including 600,000 young people. Expected lifetime medical expenses and income loss due to diabetes total approximately $643 billion in the U.S. (2016). I believe the most cathartic way of dealing with a life changing event is to dig in and get involved! Shortly after my son was diagnosed with T1D, we enrolled his older brother in two observational studies. The goal was to learn his genetic risk by finding out his allele combination. The highest risk alleles are DR3 and DR4. You get one from each parent – so nobody can inherit T1D from “his or her” side of the family. I also wanted to learn whether or not he had started developing autoantibodies. The five autoantibodies are GAD65, mIAA, ICA512, ICA and ZnT8. While on a volunteer assignment reviewing grants, I read a powerful proposal articulating the correlation between inflammation and T1D. The timing was critical because shortly after that, I received a call from the head of the study Ben was enrolled in letting us know that he was positive for two autoantibodies. I immediately thought of that amazing grant and compelling logic. We found that Ben not only had the autoantibodies confirmed, but his level of inflammation was high. I was desperate to find out what we could do to stop progression. One child with T1D was enough! Docosahexaenoic Acid (DHA) in a relatively high dose (40 mg/kg to 120 mg/kg of body weight). DHA works to suppress inflammation. You can supplement with DHA rich foods (wild caught salmon, etc. ), but this alone won’t give the dosage likely needed if already autoantibody positive. You can get an algal version that is DHA only, but fish oil works too. Just focus on the DHA number on the label of whatever source you are using. There are no known risks of DHA. It is already provided in infant formulas. 2. From experts in Nutritional Epidemiology – remember the Vitamin D. Consider reading papers about Cod Liver Oil (CLO) and correlation with the risk of diabetes. We gave it a try and his autoantibodies present in August of 2007 were gone in November of 2007. He stayed on the cocktail and remained negative until 5/2010. About age 14, he thought he knew EVERYTHING and started “pocketing” the supplements. After skipping the DHA, he became autoantibody positive again, and was convinced to go back on the “cocktail”. That worked for a few years, and then he went away to college and chose to skip again. This led to another scare with autoantibody positivity. He went back on the DHA and reversed again, and didn’t have any more autoantibodies for many years. At age 28 and went off the cocktail. He thought the risk was gone and also started on a diet for his heavy weight lifting competitions that was very high in n-6 (lots of bacon). He then tested positive for one of the newly defined autoantibodies (ZnT8). So…the journey continued. He agreed to go back on fish oil (he started taking Carlson’s “The Very Best” lemon flavored – but now he is taking OmegaRx2 from Dr. Sears’ Zone web site). He stores it in the freezer and says it tastes fine. Personally, I take DHA-450 capsules I order from Walmart. Anyway, good news again – his ZNT8 autoantibody reversed! This roller coaster of watching him go up and down has correlated with HIS choice of whether or not to take supplements. He was told he would become diabetic when he was 11 within “months”, and he just turned 30! So 19 years later, I am glad that he has been willing to give it a try. My daughter has never been autoantibody positive, even though she has the highest risk profile (identical to her diabetic brother). I bring this up because a child at high risk without autoantibodies may benefit too. With her, we tried DHA plus vaccination for chicken pox and BCG. Who knows what worked – but she has made it to age 22 without autoantibodies. This dietary intervention approach meets the “Three Legs of the Stool” which requires that it must be SAFE, EFFICACIOUS and AFFORDABLE in the general population. Limiting inflammation through the use of high dose DHA has been proven to be safe and effective in other related autoimmune disorders such as rheumatoid arthritis and lupus. Hunter P. The inflammation theory of disease. 2012 Nov; 13(11): 968–970. Limbert C. Type 1 diabetes – an auto-inflammatory disease: a new concept, new therapeutical strategies. 2012; 10(Suppl 3): I12. Bending D, Zaccone P, Cooke A. Inflammation and type one diabetes. 2012 Jun;24(6):339-46. Riachy R, Vandewalle B, Moerman E, Belaich S, Lukowiak B, Gmyr V, Muharram G, Kerr Conte J, Pattou F. 1,25-Dihydroxyvitamin D3 protects human pancreatic islets against cytokine-induced apoptosis via down-regulation of the Fas receptor. 2006 Feb;11(2):151-9. Chase HP1, Boulware D, Rodriguez H, Donaldson D, Chritton S, Rafkin-Mervis L, Krischer J, Skyler JS, Clare-Salzler M; Type 1 Diabetes TrialNet Nutritional Intervention to Prevent (NIP) Type 1 Diabetes Study Group. Effect of docosahexaenoic acid supplementation on inflammatory cytokine levels in infants at high genetic risk for type 1 diabetes. Pedatr Diabetes 2015;16(4):271-9. Ergas D1, Eilat E, Mendlovic S, Sthoeger ZM; n-3 fatty acids and the immune system in autoimmunity. Isr Med Assoc J.2002;4(1)34-38. Sørensen IM, Joner G, Jenum PA, Eskild A, Brunborg C, Torjesen PA, Stene LC. Vitamin D-binding protein and 25-hydroxyvitamin D during pregnancy in mothers whose children later developed type 1 diabetes. Diabetes Metab Res Rev 2016;32(8):883-890. Atkinson MA, Eisenbarth GS, Michels AW. Type 1 diabetes. Lancet. 2014 Jan 4; 383(9911): 69–82.